Automobile & transportation « Global Market Insights, Inc. 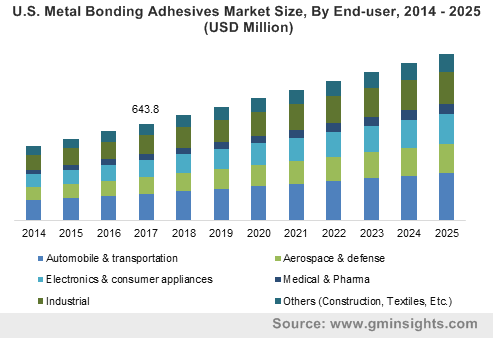 The rapid expansion of the aerospace, automobiles, industrial and medical sectors worldwide has reinforced the metal bonding adhesives market, with rising demand for efficient materials used in production, repair and maintenance of different products. Properties like thermal conductivity, dimensional stability and resistance to chemicals, vibration and abrasion have propagated the benefits of these composites. Continuous efforts by adhesive producers to develop new and improved products has fueled the growth of the metal bonding adhesives industry. These composites are commonly being used while manufacturing medical and pharmaceutical equipment, since they have to face difficult conditions and need to be highly reliable. Increasing demand for these equipment is thus certain to boost the global metal bonding adhesives market revenue. Technically, surgical instruments, imaging equipment, implantable devices are some applications in the medical segment that require the use of specific adhesive composites. Manufacturing medical devices that are reusable also pose challenges for engineers in terms of selecting the appropriate materials and adhesives. The metal bonding adhesives industry has allowed manufacturers to deliver instruments that are more reliable, durable and can withstand different conditions, invariably enhancing their performance. Needle bonding and assembling syringes are two key application areas for these composites, to provide products that can survive high withdrawal forces. The instruments are used everywhere from laboratories, ER and health clinics to surgeries in operating theaters. It was estimated that in 2016, the global syringes industry size exceeded USD 10.56 billion and could grow beyond USD 16.90 billion by 2021, indicating lucrative prospects for the metal bonding adhesives market over the coming years. The utilization of these composites can be anticipated to surge from the increased deployment of other medical devices and instruments over the forecast timespan, as the expenditure on healthcare services rises. WHO has predicted that the proportion of geriatric population will go up to nearly 22% by 2050 as compared to 12% in 2015. A major chunk of this population will be living in developed economies and would lead to increasing occurrence of chronic diseases such as cancer, diabetes, heart disorders as well as orthopedic ailments. With more cases of chronic diseases reported around the world, the healthcare system in all the regions will undergo immense proliferation and generate a need for more surgical instruments like knives and scalpels. Shifting trends in the medical segment will further alter the demand for these products, including inpatient and outpatient services. Outpatient surgeries are projected to witness about 11% growth rate up to 2022, indicating a consistent need for reliable precision instruments and the significance of the metal bonding adhesives market. Development of additional healthcare services such as biomaterial storage banks will also support the metal bonding adhesives industry growth, as cryogenic equipment also require these composites for withstanding extreme low temperatures. A crucial strategy adopted by prominent industry participants for ensuring they hold a substantial market share is to develop and bring to market new products that satisfy various industrial needs and standards. For instance, Lord, which is a major player in the metal bonding adhesives market, recently unveiled two new products called, Lord 852 / 25GB and Lord Fusor 2001/2003 NG, at a renowned trade fair. The first product was introduced as an acrylic-based adhesive ideal for both composites and metal application, with the company claiming it to have the best performance among its entire portfolio. The Lord Fusor 2001/2003 NG is based on polyurethane and though it exhibits the same open time as most PU adhesives, though it is mainly designed for use in automobiles. To elaborate, the product reduces handling time to 45 minutes from the usual 2 hours 30 minutes, providing 25% more productivity. Other leading companies in the metal bonding adhesives industry, including DowDuPont Inc., 3M Company, BASF SE, Evonik Industries, Arkema Group and Permabond LLC would also be looking to bring advanced products for their customers in the automotive, medical and industry segments. Owing to the extensive dependability by various end-user domains, the metal bonding adhesive market is estimated to grow with an appreciable CAGR from 2018 to 2025 globally. This entry was posted in Bulk & Specialty Chemicals and tagged Acrylic, Aerospace & Defense, Automobile & transportation, Electronics & Consumer Appliances, Epoxy, Global Metal Bonding Adhesives Market, Industrial Assembly, Medical & Pharma, Metal Bonding Adhesives Market, Metal Bonding Adhesives Market Size, Polyurethane, Resin Type.